Staff are one of Fielding Graduate University’s most valuable — and valued — resources. Staff are involved in all facets of the university and work in collaboration with faculty to support our students as they pursue the rigors of a Fielding graduate degree. From assisting students as they register for courses to troubleshooting an IT issue with a faculty member, Fielding staff strive to be of service and facilitate community in a distributed learning environment. Fielding has a strong commitment to social justice and diversity, and our staff takes every opportunity to live that commitment. Staff have initiated a wide range of philanthropic and team-building activities in our local community including fundraisers to support families in need, charity walks for organizations promoting girls’ empowerment, and beach clean-ups to help protect our natural resources. Fielding staff members joined Santa Barbara Channelkeeper and took to Santa Barbara’s West Beach in March of 2015, collecting and removing 100 pounds of trash from the beach and watershed area. Fielding believes in shared governance and values the participation of all our community members. To that end, Fielding Staff Council advises the president and administration in matters pertaining to the interests and needs of the staff as they strive to support the university. The council represents all staff at the director level and below, and meets regularly with the University Leadership Team. Staff Council members are elected by the staff during annual elections; their meetings are open to all staff. All work and no play make for a dull staff, so we take part in fun — and sometimes competitive — events throughout the year. 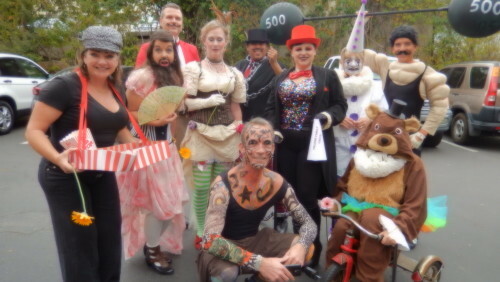 Halloween is king; the annual costume contest brings out everyone's creative side! 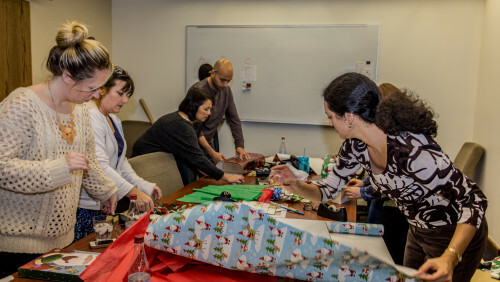 Over the 2014 holiday season, staff donated their time and resources to provide gifts to three large families as part of the Adopt-a-Family program with the local nonprofit group CALM (Child Abuse Listening and Mediation).